Join this webinar on Thursday 21 February to learn how 5G will transform the way content is created, produced and distributed. More than just a faster mobile data connection, 5G reinvents connectivity. The technology enables new types of remote productions, and coverage of more live events, news and sports in higher 4K/HDR quality, and will revolutionise the way consumers receive content, combining broadcast, OTT and data to create a seamless experience regardless of network or device. That's the theory - but how is 5G being deployed in practice? What are the early adopters doing, and what results are they achieving? The rise of esports as the biggest new live sports and entertainment phenomenon on the planet is creating new opportunities for broadcasters, digital platforms and technology suppliers. The industry's leading participants explain how esports is transforming live content and reaching new audiences as it crosses into the mainstream and catches the attention of the biggest media businesses. Broadcasters with linear channel playout operations are increasingly turning to the cloud to deliver the flexibility and efficiency they need to remain competitive and grow their international footprint. Cloud playout offers the potential for rapid channel launches, more efficient and resilient operations and a clear commercial model enabling linear channels to be more successful and profitable. In this webinar, we'll explore how Tata Communications customers are using Cloud Playout to deploy a unified solution for both playout and distribution on a global basis, and why cloud is fast becoming the preferred option for many linear channel operators and broadcasters. - Explore cloud success stories, like Woohoo TV, Latin America’s first dedicated channel for sports, music and youth culture. It expanded rapidly into new markets in the U.S. without needing capital investment by deploying Tata Communications' Cloud Master Control and Video Connect solutions. - Learn how Cloud Master Control delivers a future-ready virtualized IP environment powered by industry-leading technology vendors, enabling channel operators to scale rapidly from a single channel to a large-scale multi-channel operation, with complete flexibility and reliability. - Understand the business, technology and operational benefits and the crucial questions to ask before moving your channel playout operation to a cloud playout provider. The boundaries between broadcasters, pay TV platforms, OTT operators and telecoms providers are blurring. Competitors are becoming partners as content owners recognise the role of telcos to deliver their services to a bigger audience and drive new revenues, while telecom operators are creating compelling consumer experiences built around video. Convergence is now all about putting the consumer at the centre of a connected media and entertainment experience where the distinction between live broadcast and on-demand services disappears. - Why high-quality video services are vital for telecom operators wanting to engage consumers and grow their revenues through "experience monetisation"
IBC is collaborating with TM Forum – which represents more than 850 global communications service providers and their suppliers - to bring the TM Forum’s highly successful collaborative Catalyst innovation programme to the converging media, entertainment, technology and telecoms value chain. This special webinar will fully outline and explain the programme and, importantly, how you can get involved in this fast track innovation programme to showcase your leading role in developing and designing solutions to address some of the current media & entertainment industry challenges. This webinar, brought to you by Rohde & Schwarz, explores the future of uplink amplifiers, including solid-state designs, linearity, signal quality in order to help you select the right amplifier for uplink scenarios. Don’t miss the highlights of IBC2018 with this inside preview of the big themes and must-see tech on this year’s show floor. Our panel of broadcasters and exhibitors guide us through their predictions of the hot topics from IP to AI, the rise-and-rise of OTT, and the impact of 5G, blockchain and ATSC 3.0. Plus the new focus on building an efficient supply chain to create, manage, store and distribute content. Join us to help make your IBC experience the best yet. This webinar cuts through the hype to reveal how media companies are actually using AI tools throughout the content supply chain - from aiding craft and creative work in post-production, automating metadata extraction and compliance, to making smart content recommendations to audiences. Our speakers will explain how best to use AI, what we can and can't do, and how it will continue to change workflows into the future. Great content alone is not enough to sustain a successful on-demand internet-delivered OTT service. Whether it's broadcaster catch-up, special-interest content or producers like HBO and Disney going direct, the pressure is on for platforms trying to compete with the big beasts Netflix and Amazon. With the announcement of Salto as a joint venture of broadcasters in France, and UK channels investing in updating Freeview Play, OTT is centre-stage once again. Audiences have huge expectations of user experience, video image and quality-of-service - regardless of the network or device they are using. Delivering and managing a consistently-high quality of experience is crucial for media companies wanting to deliver a popular, engaging and profitable OTT service - whatever the content and business model. Leading OTT operators and their technology providers discuss how they have designed-in quality and user experience all the way through to consumers' devices, showing how this directly drives audience growth. They will reveal the risk factors that can destroy audience engagement, including poor streaming performance and data privacy and security fears. As OTT becomes inseparable from live broadcast, solutions for streaming time-sensitive, high-value live events and sports are assessed. Producing and managing the most valuable live sport broadcasts is being transformed through AI-enabled tools automating critical parts the production process. From AI cameras focusing in on the action, automated multi-channel sound mixes, to powerful media management tools linking live action with real-time metadata to speed production and automate match highlights creation. 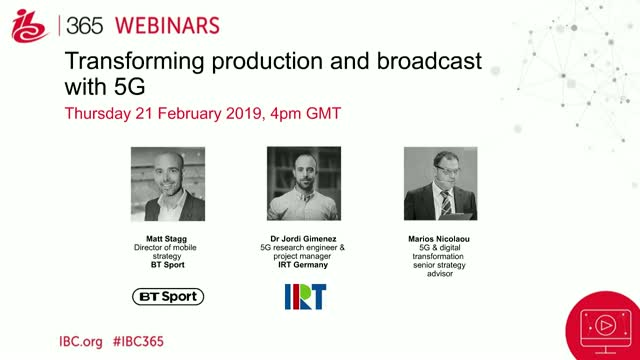 In this webinar we'll explore cutting-edge tools for live sports production and hear from leading broadcasters that are using them. Not everything that happens in Vegas stays in Vegas: join us right after this year's NAB Show for a full review of what went on, what was hot, and what happened at the conference and show floor. It's an opportunity to take the pulse of the industry and find out what media and entertainment tech leaders are focusing on right now. Which vendor's product launches and announcements set the strip talking -- and which disappeared without trace? What's happening in the content supply chain, and what's the future for blockchain, AI, cloud and IP? An international panel share their analysis of the big themes and announcements of this year's show - as well as revealing the unofficial themes and what people were really talking about. With viewers consuming content on an increasing array of devices and platforms and the virtualisation of workflows, the task of protecting assets has never been so complicated and costly. Add to this the fact that the media industry is a high-profile target for hackers and it becomes clear that cyber security is at the top of the agenda for all those involved in the media supply chain. Join this IBC365 webinar, sponsored by Juniper Networks, to hear from senior industry figures who will examine where the weaknesses lie in the production, delivery and distribution workflow and consider what can be done to address vulnerabilities and make sure that film and TV is consumed as intended by broadcasters, platforms and content owners. As the worlds of media and telecoms continuing to converge and overlap, the strategies and concerns of fixed and mobile operators are of increasing importance to the media, entertainment and technology sector. With broadcasters and content owners required to deliver programmes to an ever-increasing array of platforms and devices the role of networks, carriers and operators has never been so vital. And for telcos, content can be used to boost offerings, helping to entice and retain customers. The IBC365 editorial team will pick through the product launches, announcements and themes of Mobile World Congress to make sense of the show for those involved in the media, entertainment and technology industry. Find out what was revealed and discussed at Mobile World Congress and why it is important for you by joining this IBC365 webinar. Watch now on demand to explore how remote production is changing the way sports broadcasters operate. Remote production gives broadcasters the ability to produce live broadcasts at a distance from the actual event, by sending raw camera feeds, audio and equipment control over a telecom infrastructure to a central studio facility. It helps to generate high volume of sports content economically, thereby improving productivity and efficiency for sports broadcasters. Today, for any live event, about 30-40 people travel to each location with kit and other equipment to produce the broadcast feed at the venue. This is not only expensive but also logistically a nightmare. By producing feeds remotely at a central location only a handful of camera crew would have to travel while the technical director, commentator and other key crew members can finalise production at a central location. In this webinar we explore how broadcasters and production companies can overcome any technical and operational challenges to embrace the benefits of remote production. IBC365’s second webinar on IP will offer practical insights on building IP-based broadcast facilities. The webinar features presentations from three media firms working with IP, including case studies from broadcasters working with end-to-end IP and one systems integrator who is providing IP tools and services. The switch from SDI to IP-based broadcast studios is now well under way. Going fully IP will allow broadcasters unparalleled flexibility from production to workflow to playout. Through a series of early adopter case studies, IBC365 examines how broadcasters and suppliers are meeting this transition and what real-world benefits the IP revolution can bring broadcasters, vendors and audiences. IBC365’s webinar on the cloud will examine how the technology has been adopted by the post-production, content management and playout sectors. Three case studies from a post-production facility and two broadcasters provide the basis for a discussion about the adoption of cloud-based services and tools. Through a series of early adopter case studies, IBC365 will examine how vendors and technology suppliers have responded to this demand, whilst also looking at the changes broadcast and media businesses need to make in order to derive maximum benefit from the cloud. IBC365 is an online community platform providing business knowledge for the global media, entertainment & technology industry.